The Congressional Budget Office (CBO) recently released the highly anticipated estimated impact of the House Republicans’ proposed health care reform, the American Health Care Act (AHCA), finding that the bill would increase the number of uninsured Americans by 24 million by 2026 and reduce the federal budget deficit by $337 billion over 10 years. While Speaker Paul Ryan has touted the projected 10 percent reduction on premiums by 2026 and Democrats have criticized the exchange of Medicaid cuts for high-income tax breaks, Americans need to know how they may expect to be affected by the proposed legislation. Here, we answer nine important questions about the legislation, its estimated impact, and what Americans can anticipate moving forward. Does the American Health Care Act repeal the Affordable Care Act (ACA)? The legislation does not repeal the ACA in its entirety, but it does make significant changes to many ACA provisions, including the law’s Medicaid expansion, financial assistance for people purchasing individual market health insurance, and federal requirements that individuals have and employers offer health insurance. The law would also limit federal funding for state Medicaid programs. However, the ACA’s insurance market regulations—including the requirement that insurers offer coverage to people with pre-existing conditions on the same terms as to everybody else—would generally not change under the AHCA. The ACA provisions affecting Medicare are generally not affected. While some Republicans have voiced support of keeping the ACA’s pre-existing conditions requirement regardless of further reform efforts, one reason Congressional leaders may have avoided changing those provisions is because they intend to pass the AHCA through the “budget reconciliation” process. This process allows legislation to pass with fewer votes in the Senate to pass but limits what types of changes that legislation can include. A full repeal would require a filibuster-proof 60 votes in the Senate, requiring at least eight Democrats to vote to fully repeal the ACA. Instead, the budget reconciliation process allows a bill to pass the Senate with only a simple majority, provided it is limited in scope to policies with a budgetary impact or are necessary to such budgetary provisions. What will AHCA do to my insurance costs? Under the ACA, the federal government provides advanced tax credits for premiums, called subsidies, which are determined by your income, age, and the cost of insurance in your area and grow as the price of insurance increases. They are also only available to people with incomes up to 400 percent of the federal poverty level (FPL), approximately $47,520 for a single individual or $97,200 for a family of four. For individuals with incomes between 100 and 250 percent FPL, the ACA also included extra cost sharing subsidies to help with out-of-pocket costs. In the new GOP bill, subsidies are determined by age and will grow with inflation, but do not vary based on income or geographic area even though premiums can differ widely depending on where you live. It also removes the extra cost sharing subsidies for those between 100 and 250 percent FPL. AHCA also includes changes that will affect premium costs. As our colleagues explain, the CBO predicts that the Republican plan will caused a reduction in the actuarial value (AV) of insurance provided because it removes AV requirements set by the ACA. The AV of a plan is the share of medical costs paid by the insurance company, so a lower AV means that individuals will pay lower premiums, but the insurance will provide less coverage, and individuals will likely pay more out-of-pocket. 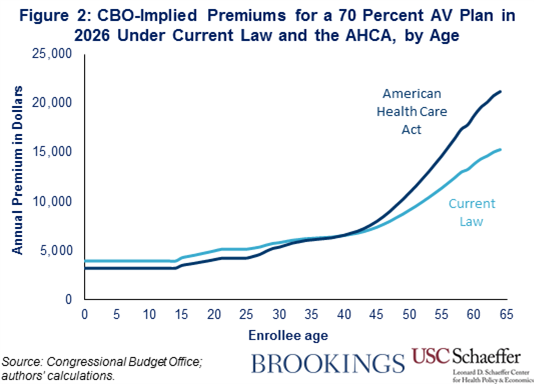 AHCA also includes other incentives that lower costs for younger enrollees, such as loosening the age band by allowing insurers to charge five times as much for a 64-year-old compared to a 21-year-old, instead of three times as much, which is what the ACA dictates. This will lower premiums for younger individuals, and increase premiums for older enrollees. On average, our colleagues predict that pre-subsidy premiums will decrease for people under age 39 compared to current law and increase for people ages 39 or older (as displayed in the below graph). What this all boils down to is that how much it costs to purchase coverage under the AHCA will vary widely depending on where you live, how old you are, and how much you earn. On average, premiums are likely to be higher for people who have individual market coverage today, but the precise impact will depend on each individual’s situation. In general, enrollees who are younger, have higher incomes, or live in low-cost areas are most likely to be better off, while enrollees who are older, have lower incomes, or live in high-cost areas are most likely to be worse off. I hear the AHCA gets rid of the mandates. Does this mean I would no longer be forced to buy insurance? Yes. The AHCA would essentially end the individual and employer mandates but introduces a continuous coverage provision (though questions have risen as to whether this provision will remain in the bill). So while you would no longer be required to buy insurance, if you were uninsured for more than two months (technically 63 days) in the past year and then decide that you do want insurance, you would pay a penalty equal to 30 percent of your premium for one year. The thinking behind this is that people would stay insured to avoid the additional 30 percent penalties. But one worry is that with such a modest surcharge, healthy people would still choose not to buy health insurance, leaving only sick people who need coverage in the market. Without healthy low-cost people, premiums would increase to cover the disproportionate number of people with high medical costs. The CBO and Joint Committee on Taxation estimate that getting rid of the individual mandate would significantly reduce insurance coverage (by 15 million), and that the continuous coverage requirement would actually further reduce coverage by 2 million people by the tenth year, since healthy people would face higher premiums and greater documentation requirements when signing up for coverage. How will the House GOP health care bill affect individual market premiums? Another part of the AHCA removes penalties requiring employers to provide insurance to employees. Coupling broader individual tax credits with removal of the mandate, it is expected that many employers will stop offering coverage to employees. As a result, of all of the AHCA’s various changes, CBO estimates that the number of people with employer-sponsored insurance would decrease by 2 million in 2020 and by 7 million in 2026. Medicaid expansion was a large, controversial piece of the ACA. What happens next for states that did and didn’t expand? The Medicaid program is a partnership between states and the federal government, with the federal government generally contributing between 50 and 75 percent of costs before the ACA, depending on state per capita income. To encourage states to expand Medicaid to more low-income adults up to 138 percent FPL, the federal government increased the federal share for this newly eligible population to 100 percent from 2014 to 2016, falling to a permanent 90 percent rate in 2020. The new GOP bill gets rid of this higher contribution and returns to each state’s original pre-ACA rate for new enrollees from this population that became eligible from the ACA. However, a new proposed amendment released Monday night does allow work requirements for non-disabled adult enrollees, and encourages this by offering a five percent increase in matching funds if they do so. The amendment also restricts states from covering adults with incomes above 133 percent FPL after 2017, and states that have not already expanded cannot expand, effective as soon as the bill is passed. Under the ACA, the CBO estimated that a few more states would expand Medicaid in the coming years, but without that enticing federal matching incentive, the CBO now estimates that AHCA will lead to 5 million fewer new expansion enrollees by 2026 compared to what they expect now. It’s also very likely that some states that have already expanded will revert to their pre-ACA Medicaid eligibility requirements, unable to bear these higher costs. Due largely to the reduction in states operating the ACA’s Medicaid expansion, the CBO estimates a 14 million decrease in Medicaid enrollment by 2026. The CBO score for the amendment will be updated later this week, and we will update accordingly. I keep hearing about per capita caps and block grants for Medicaid enrollees. How do these actually work, and what does this mean for costs? Currently, Medicaid has open-ended funding, meaning that the federal government covering a certain percentage of whatever costs accrue, without limit. What AHCA proposes is a dollar limit on spending from the federal government – a capped amount of money per enrollee, based on the current average cost in the state in 2016 for each category of enrollee (child, adult, disabled, and elderly). In the new proposed amendment released Monday evening, the AHCA also allows states to accept block grants for a period of ten years for traditional enrollees (adults and children) instead of per capita allotments. The amount of the block grant is similar to per capita allotments – the per capita cost of this population is multiplied by the number of enrollees, with funding increasing by growth in the consumer price index, but not changes in population. Both options leave little flexibility for states in cases of emergency, like outbreaks or natural disasters, when spending can increase dramatically and unexpectedly or simply if health cost trends in their state diverge from the pre-specified rate at which the caps grow. So, while the CBO predicts that this will decrease federal spending, states must compensate by either increasing their spending through potential cutting of other non-medical sectors of the state budget or raising taxes, or through reducing Medicaid spending through things like payment cuts for providers and health plans, getting rid of optional services for enrollees, or restricting enrollment eligibility. Block grants in particular encourage cuts to enrollment more than per capita allotments, since the amount does not change along with population increases or decreases, and this shifts the cost for care of this cut population to the states. Is it true that Planned Parenthood would lose all of its government funding? Under this proposed bill, Planned Parenthood would lose access to all federal funds for a year. If cut, this funding, which makes up around 40 percent of Planned Parenthood’s annual operating budget, would not only reduce access to care for the communities served, but also result in thousands of additional births. The CBO estimates that an additional $21 million would be spent for medical care for these additional pregnancies and births, particularly affecting low-income communities with limited health care provider access. Yes, defunding Planned Parenthood would save an estimated $156 million by 2026, but 15 percent of those living in low-income areas where Planned Parenthood is one of the only health care providers, would no longer have access to reproductive or general health care. What exactly is the Prevention and Public Health Fund, and what is the bill proposing to do to its funding? The Prevention and Public Health Fund was created under the ACA and is dedicated solely to expanding, improving, and sustaining public health and prevention programs. 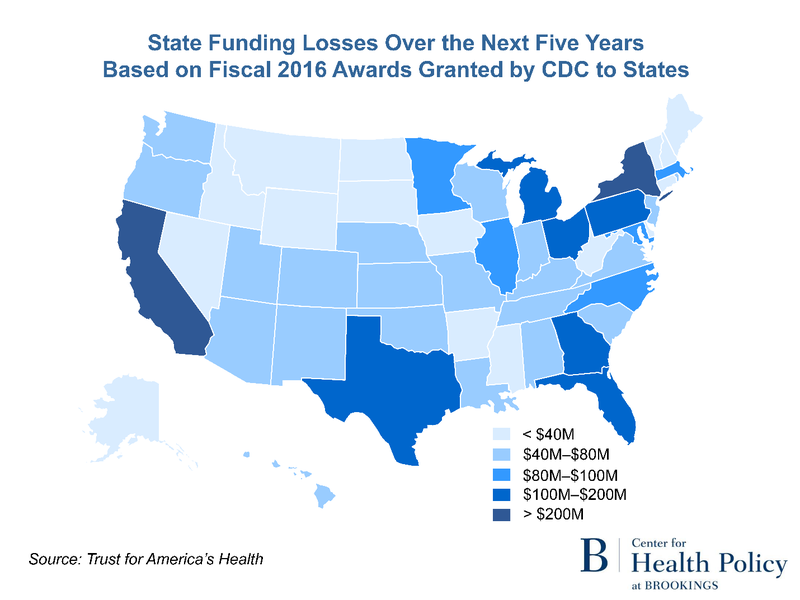 With these dollars, the Centers for Disease Control and Prevention (CDC) funds programs related to emergency disease outbreak response and preparedness, immunizations, the opioid crisis, life expectancy, and other public health issues affecting Americans. An analysis last month from the Trust for America’s Health (TFAH) estimates that the fund accounts for around 12 percent of the CDC’s annual budget. In fact, the Public Health Fund provides funding for almost half of the CDC’s immunization program budget, impacting its ability to track vaccinations and improve deadly infections. I have a preexisting condition: would this bill permit insurers to charge me more for my coverage, exclude coverage for my condition, or even deny me coverage? No. The AHCA budget reconciliation bill does not alter the ban on preexisting condition exclusions. As a result, individuals living with a preexisting condition such as diabetes, cancer, or congenital heart failure will continue to be protected from higher premiums, coverage exclusions for treatment, and from health plan denials as a result of their health status. However, President Trump and Republicans have stated their intent to pass further iterations of health reform, which may or may not amend or eliminate these protections for individuals living with preexisting conditions. I’m not yet 26 years old, would I be able to stay on my parents’ insurance if this bill is passed? Yes. Just like the preexisting condition ban, this bill leaves in place the ACA’s provision allowing young adults up to the age of 26 years to remain on their parents’ health insurance plan. Kavita Patel is a practicing primary care internist at Johns Hopkins Medicine and a nonresident senior fellow at Brookings. She did not receive financial support from any firm or person for this article or from any firm or person with a financial or political interest in this article. She is currently a board member of Dignity Health, Tesaro, and SMM Heath which are entities that may have an interest in this article.